The distinction between God and man is clear; He is everything “warmth and light” and we are like a “cold dark stone”. However, by His grace “still [He has] made [us] to shine”! In my quilt, I aimed to translate this imagery and symbolism of God as the Sun and us as the Moon using different colors and textures of fabrics, shapes, stitching lines and the image itself. Equilateral triangles represent the perfection of God in three persons while the golden colors represent more literally the concept of the Sun. From the portrait of Christ, the quilting lines radiate outward through the more chaotic, dark and crater-like segments which represent the Moon. 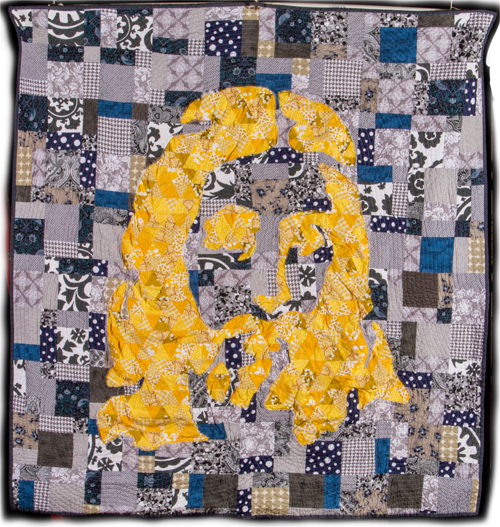 The back of the quilt shows three vertical lines representing the Father, Son and Holy Spirit. The gradation of color from light to dark symbolizes how the intimacy of our relationship with God will change based on the amount of quality of time we spend with Him. The relationship is always there as God is forever faithful even when we are faithless (2 Timothy 2:13), but the impact He can have within and throughout us is dependent on our commitment to abiding in Him. Throughout this artistic process, I have come to a deeper understanding of an elemental truth — how vital “turning [my] face” to God is if I intend to shine my light before men so they will glorify my Father in Heaven (Matthew 5:16). I am nothing of Kingdom-impact without quality time spent with Him.